BURN FAT & PRESERVE MUSCLE: If you\'re looking for the best, you\'ve found it! DUB BURNER is the world\'s first muscle-preserving fat burner A TRUE SUPER FORMULA. Its unique thermogenic formula helps burn fat while preserving muscle, and improves mental focus, mood, and energy. dub Burner is gentle on the stomache,an appetite supressant, and you will not feel bloated after taking. TESTED AND TRUSTED: Third-party tested supplement made exclusively with premium ingredients including green tea extract, Dandelion Root, Guarana Extract, Chromium Picolinate, Vitamin B12, Potassium, Caralluma Fimbriata, and Raspberry Ketones to help burn stubborn belly fat. 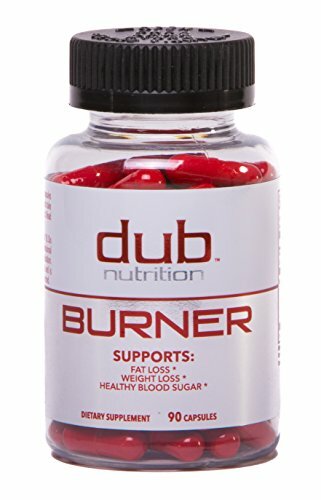 #1 MOST EFFECTIVE FORMULA: dub Burner is the most Popular Nitric Oxide Booster that contains L-Arginine , One Of Nature\'s Most Powerful NO Boosters. Zero artificial substances, zero synthetic additives, zero preservatives. OUR MONEY BACK GUARANTEE! DUB NUTRITION products never compromise on quality and always include clear and complete supplement facts with \"proprietary blends.\" We stand by our products 100%. If you are not completely satisfied with any Dubs product, we will help you resolve your concern or provide a full refund. Want a further bulk discount? BUNDLE AND SAVE TODAY: Get 15% OFF any 2 products with code \"REBATE15\" or 20% OFF any 4 products with code \"REBATE4X\"
LEGACY! DUB stands for Discover your Ultimate Body 10 Years in the Making. We have focused on changing people\'s lives physically one person at a time. One thing has ever mattered to dub: our customers. Before becoming a best-selling national brand with thousands of loyal customers and followers on social media, this was our priority and this will never change. Our experts are available via email or social media to answer your questions. Our products are proudly formulated & made in the U.S.A.